The Characters of Chapter 2 Writing Assignment for Leroy Ninker Saddles Up! Leroy Ninker Saddles Up Bundle. Leroy Ninker Saddles Up is an incredible novel by Kate DiCamillo. 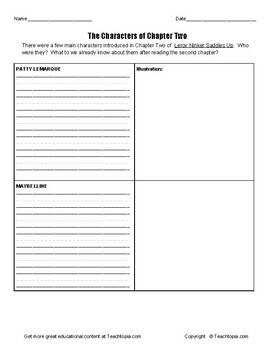 This writing assignment is about students writing a few details about the 2 main characters introduced in chapter two of Leroy Ninker Saddles up. Students are also given a space to illustrate the characters. In case you don't know this series, it is a spin-off of the Mercy Watson series. This assignment is created by Jody Weissler for the Teachtopia Education Network.